On November 20,2013 AOL announced it would be shutting down Winamp and its services on December 19th. Concerned users called for AOL to open source the app, but nothing materialized, as the deadline passed. Rumors circled around about a possible acquisition by Microsoft. After a month long drama of the acquisition, it turns out that Microsoft did not try to acquire Winamp, and instead acquired a company owned by the CEO/Founder of Radionomy, Alexandre Saboundjian. Later a forum member at Winamp.com discovered that Winamp.com’s nameservers were registered to Radionomy, leading to suggestion that AOL had sold Winamp to them. Until yesterday there was no source confirming the takeover, but now Techcrunch, a blog owned by AOL have confirmed it. AOL have sold Winamp & Shoutcast to Belgian online radio service Radionomy, in a deal that is supposedly worth somewhere between $5 million and $10 million. AOL will get a 12% stake in the Belgian company as part of the deal. Nullsoft had sold Winamp and Shoutcast for a whopping $80 Million to AOL in 1999. The acquisition of Shoutcast means that Radionomy now owns almost half of all internet Radio stations in the World. The number stands at 60,000. Radionomy have said they will be offering Winamp as it is, and they will add access to the 60,000 stations they own. 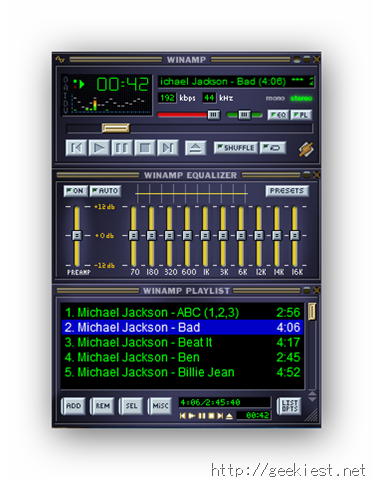 In addition to this Winamp will get support for 16 languages, playback support for 60 audio and video formats, and 6,000 skins, plug-ins. Though there hasn’t been an official announcement at Winamp.com, it is worth noting that the website no longer carries the message that “the music player and its services will be shutdown”. We will have to wait and see when Radionomy will update the desktop and mobile apps of Winamp, and considering the declining number of users, whether they will offer the formerly premium features for Free.